Clinic Synopsis: Often, jazz language instruction begins with improvisation studies. In this session, Grammy-winning saxophonist, Jeff Coffin and John LaPorta Jazz Educator of the Year Award-winner, Caleb Chapman present a new approach to introducing young musicians to the jazz language with a focus on well defined articulations and swing concepts. Clinician Biographical Information As President of Caleb Chapman Music, Caleb directs 150 musicians in 11 ensembles, including the award-winning Crescent Super Band. He is also the Music Academy Director at Pioneer High School for the Performing Arts. For his efforts, Caleb was named the 2011 “John LaPorta International Jazz Educator of the Year.” Caleb’s students have been honored with 17 DownBeat Awards and 7 consecutive “Best of State” awards for Utah. Utah Best of State also named Caleb Utah’s “Best Educator” (2011) and “Best Music Educator” (2012). Caleb’s bands have been featured at many prestigious festivals and have performed with over 200 guest artists, including Randy Brecker, Joe Lovano, Christian McBride, Peter Erskine, Gordon Goodwin, Wayne Bergeron, Esperanza Spalding, and Bob Mintzer, to name a few. Caleb is a Board Member for the Jazz Education Network (JEN) and an artist and clinician for Yamaha Saxophones, Rico Reeds, Alfred Publishing, and JodyJazz Mouthpieces. Second Clinician Biographical Information Jeff Coffin is an internationally recognized saxophonist, bandleader, composer and educator and has been traveling the globe since the late 20th Century. He is a 3x Grammy Award winner from Bela Fleck & the Flecktones and played with them from 1997-2010. In July 2008, Jeff began touring with Dave Matthews Band, and officially joined the group in 2009 following the tragic passing of founding member LeRoi Moore. 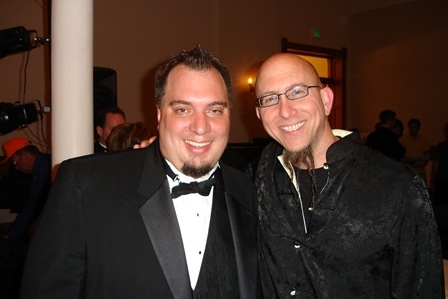 When not on the road with DMB, Coffin fronts his own group, Jeff Coffin & the Mu'tet. Jeff is a heavily in-demand clinician, a Yamaha Performing Artist and, since 2001, has presented more than 300 solo and Mu'tet music clinics from Farmington, Maine to Perth, Australia to students of all ages to raving reviews. Education continues to be an important part of what Jeff shares with others, and he is a tireless champion to players of all ages and levels to discover and cultivate their own musical voice.